I am so behind with my posts at the moment; there are some I’ve drafted from nearly a year ago which I still haven’t published and other things I haven’t even started writing. Hey ho, better late than never, I hope. Here’s a brief account of my upcountry adventures of over two weeks ago, meeting up with other food bloggers. To say I don’t get out of Cornwall much is not quite true, as I cross the border into Devon several days a week to go to work. But I love my home county and find more than enough to do and see here, so I don’t feel the need to leave it very often. Sometimes though, an unmissable event drags even a home bird like me out of her nest. A food blogging conference to be held in Birmingham was the lure – the first in the UK to be held outside of London, Bite n Write organised by Annie Ko. As well as several presentations I hoped I’d find useful, I was also keen to meet up with food blogging friends Kath of The Ordinary Cook and Jac of Tinned Tomatoes. Having finally committed to this, it just so happened that Vanessa Kimbell of Goddess on a Budget invited me to attend her Lets Make Christmas event at Fortnum & Mason in London, the very day before Bite n Write. Well that was just too fortuitous to turn down, so I didn’t. This was a very glamourous affair for a country bumpkin ;-), but it was also very warm and friendly with lots of familiar blogging names to meet and have a chat with. As well as this, the aim was to make a Christmas gift or gifts, blog about it, then bring it along to be judged by Dan Lepard – some fabulous prizes were up for grabs. Ultimately they were swapped for another blogger’s gift, so we all ended up being winners in the end. The tables laden with gifts were awe inspiring and many had put huge amounts of effort into their creations. My rather humble offering was some of these Spicy Pumpkin Biscotti. In return, I was thrilled to receive a jar of candied pecans from Jaynerly and most delicious they are too. I will definitely be making some Christmas nuts to this recipe. My biscotti got carried off in the hands of The Botanical Baker. It was fun to meet so many lovely food bloggers and a delight to finally meet Dan and his partner David after the aborted attempt back in October. It was also really good to meet Vanessa who put a lot of effort into organising this event and deserves our thanks. She was just as warm and lovely in person as she comes across on the radio and her blog. You can see her write up of the event including pictures, a list of the winners and links to all of the participants’ blogs here. As it was an afternoon event, it was quite appropriate for us to drink tea and eat F&M’s delicious mince pies and even more delicious chocolate mousse mini logs, so I knuckled down and did my duty. It was good to meet bloggers I hadn’t come across before but I was particularly pleased to put faces to names I knew so well and especially the following – We Should Cocoa (ers) all! Not having been to Fortnum & Mason for over 20 years (how scary is that? ), I took the opportunity to have a bit of a mooch. Gracious, there were some fabulous goodies on offer and it all looked so tempting. It was, of course, rather on the pricey side, so I was very pleased that we were all given a pack of White Chocolate & Cranberry Florentines to take home with us. Charlotte of Go Free Foods – who I hadn’t managed to spot at Lets Make Christmas the day before. The conference was held in the colourful Custard Factory, a suitably named venue for a food bloggers event. A photography workshop by Craig Fraser of FraserShot started the day. This was really interesting, but the tips I’d been hoping for had only just started, when time ran out and it was on to the next topic. I try not to be too envious of Judith Lewis of Mostly About Chocolate, but she does get to try a lot of very nice chocolate for her blog reviews. She is also an expert on SEOs and it was this that was the subject of her talk. I only had a vague awareness of what SEOs were up to this point and Judith imparted some highly useful information – none of which I’ve yet acted upon! My chocolate envy was soon assuaged by the workshop I was was most looking forward to. It was not only all about chocolate but more to the point was all about tasting chocolate. Artisan du Chocolat gave us quite a feast of flavours both new and old. Starting with a 100% cocoa bar and working down the spectrum, we sampled one bar after another. Flavoured bars came next with a 40% milk chocolate Masala Chai generally being voted everyone’s favourite followed by Chilli Mole. Then it was on to the truffles which included lemon & thyme, tobacco (!) and salted caramel. Some appealed more than others, but there wasn’t one I wouldn’t have had a second taste of given the opportunity – not even the coffee! This was not the case for everyone as I did see some grimacing going on and even some chocolate being, not so surreptitiously, spat out. Our enthusiasm for chocolate led to the programme running behind schedule so Jeanne Horak of Cooksister gave a rather rushed but really useful talk about promoting your blog and finding your own writing style. Michelle of Go Free Foods gave an even more rushed presentation about developing recipes, specifically with food allergies in mind. By this point, I had rather lost the plot and when James Bolton from Derezzed Media held a workshop about WordPress, I switched off. I didn’t manage to regain my attentiveness even for Ben Frazer of Cupcake Artisan and slipped off to catch my train home during his talk on video blogging. For further info, Catherine Moran of Word Stew has made some useful notes on her Bite n Write post highlighting the key points made by most of the speakers. In addition to the chocolate, we had some very tasty and attractive cupcakes during the day, lunch (which very nearly didn’t materialise for the vegetarians) and a goody bag to take away with us which included a delicious fresh methi masala curry paste from Bipins and a tin of Steenbergs Christmas Tea. Turns out this post wasn’t quite as brief as I was intending, but there was so much going on at both events and so many bloggers attending, this only scratches the surface. You’ve been busy. How great to meet so many bloggers, get to taste lots of new food and all that useful info too. Glad the south west was well represented and I wish I had gone too! My goodness – what a busy weekend. Sad not to have been at Fortnum & Masons, I was so looking forward to meeting everyone. Hopefully there will be a similar event next Christmas! It was so lovely to finally meet you. Those Artisan du Chocolat chocolates were divine. I didn’t grimace once and could happily have taken the whole table home! This is a good review of the conference. It was a shame I had to rush off early. Throughly enjoyed meeting you too Choclette- it was just lovely meeting all the people behind my favourite blogs. That chocolate tasting session at Bite n Write sounds just up my (sweet toothed) street…. It was a thrill to meet you and all my other blogging chums, and this is a GREAT write-up……you are putting me to shame as I have not written mine yet! I devoured my florentines on the TGV back to France! LOL! Lovely write up of your meet ups, makes me soooo jealous. Maybe next year. So lovely to hear your take on these 2 events. Sounds like it was well worth a trip out of your home county 🙂 I am gutted that I couldnt make Let’s Make Christmas. I hope there will be something similar next year. Those chocolates look divine!! If its any consolation I too have posts I first drafted over a year ago, still yet to publish! Glad I am not the only one! I didn’t manage to attend either event due to work commitments but both sound so good! These sounded like such great events, I’m sorry I didn’t get the chance to go and meet some of the bloggers I talk to or hear from on an almost daily basis! 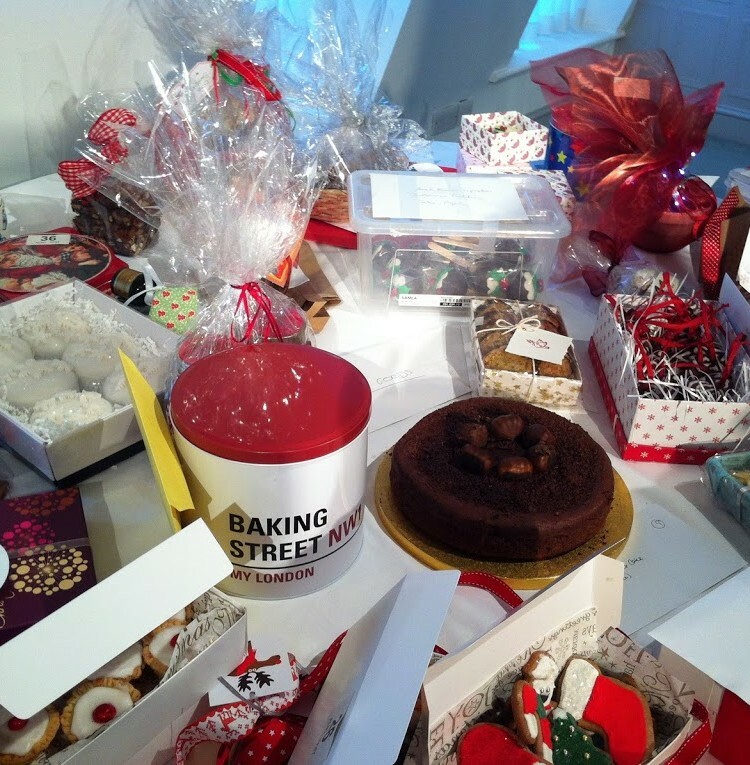 The Let’s Make Christmas event looked especially fun – am looking forward to trying out some of the round up of recipes! Hope to see you at another event soon. Sounds like a wonderful couple of events. I’m so pleased you finally got to meet Dan! I really enjoyed meeting you at Vanesa’s Let’s Make Christmas event too! So great to be able to meet and talk food for a few hours! what a busy weekend – no wonder you are short of time to write up blog posts – I know how you feel – I have too much blog backlog but I just keep cooking new things and adding to it – sigh! Kate – it’s making me think it’s time for a meet up down here! Both of these events might be running again next year. Dom – you know what? I still have my Florentines in tact – can’t quite bring myself to open them. Jennifer – what a shame you were unwell, it would have been nice to meet you, but as you say, there is always next year. Kath – think some of the others who stayed on had a good time, but to be honest, I’d had enough by then and was happy to slip away – food blogged out! As for the chocolates, wished I’d bought some to bring home now! Jude – it’s funny isn’t it, with all the wonders of the internet, people still prefer real social interaction. Karen – there don’t seem to be as many write-ups as I was expecting. Glad you ate those Florentines, you deserved them. Helen – Thank you, it was good to meet you too. As for LMC, there is always next time – hopefully! Janice – they both seemed a long way to travel from Cornwall but so much further for you. Anne – thank you, that does make me feel better. It’s hard to keep up with everything. Little Loaf – there are enough recipes there to keep us going for ever I think! It would have been good to meet you – there is always another year! Charlotte – so sorry about getting your name wrong. Yes indeed, maybe get to meet you again at a SW event. Jeanne – thanks, I’m really glad I went too. It was really good to have something going on outside of London. Celia – it was fun to meet up with a few other food bloggers. Just wish there were a few more of us down here. Johanna – glad it’s not just me. Somehow, the cooking is always easier! Busy you! I need to get out more.